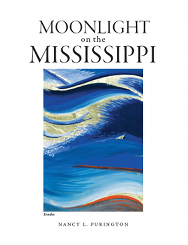 Artist Nancy Purington’s new book, Moonlight on the Mississippi, is available now, featuring an extensive collection of paintings and photographs of the Mississippi River. Nancy Purington was born in Scott County, Iowa, where the Mississippi River meets the Wapsipinicon and the channel shifts from north/south to east/west before resuming its meandering course to the gulf. The resulting latitudinal platform expands the radiance of sun and moonlight above myriad reflections and patterns of change. Lock & Dam No. 15, the world’s largest roller dam, resists the forces of nature competing to rule the way of water. Opposing wills and alluvial harmonies are illuminated in plane geometry and fluid atmospheres. Purington’s aesthetic sensibilities combine medieval perspective and modern art intention with traditional and experimental methods. Indigo, lapis, cobalt, cadmium, gold, silver, palladium, sticks, stones, shells, pearls, and digital photographs express the transformational nature of the Mississippi River experience. Artists are often drawn to the same subject over and over again. In Nancy Purington’s case, it is the Mississippi River, for Monet it was water lilies and for Cezanne it was Mont Sainte-Victoire. Why is this? If an artist has created a successful image of their subject, a powerful work of art, what propels them to revisit the same subject, scene, or place? When Purington puts color and form to paper, usin­g oil, watercolor, pastel, gouache, and gold leaf to render the countless shapes and shades of a wave ebbing and swelling in the Mississippi, she brings the macrocosm of the river into focus. She helps us to see the endless beauty of the river and to contemplate the mystery of a moment, encouraging us to live, to look closer, again and again. Nancy Purington’s work graced the walls of the Minnesota Marine Art Museum’s 2013–14 exhibition “Tri-State Invitational: 3 Women from 3 States.” I use the word “graced,” not in the nonchalant way that we are used to hearing that word, but in an intentional way. The defining quality of Nancy’s work is a distillation of the grandiose power and earthy grit of the Mississippi River environment into something graceful, precise and elemental. Her vision is a powerfully personal way of seeing the world — full of optimism and wisdom resulting from a lifetime of observation and love. This unique vision is reinforced through a skillful use of materials, yet often culminates in a subtle presence, with the greatest reward for patient eyes and an open heart and mind. As early as the 1970s, the repetitive patterns and symbols in cut-pile cloth made by the Kuba peoples of the Democratic Republic of the Congo were particularly mesmerizing to Nancy Purington, which she encountered as she perused the renowned collection of African Art at the University of Iowa Museum of Art. As Nancy continued to explore the many languages of water, she identified with the significance of the Kasai River to the Kuba peoples. The geometric shapes, meander and moiré patterns, loop-ribbon forms, and knot motifs, as well as the virtuosic dyeing, weaving, and embroidery techniques presented by Kuba cloth, further inspired Purington to explore the possibilities of similar references in her Mississippi River works. As an artist, Nancy Purington’s very being is centered on the need to create and make order out the emotions engendered by her passion for the beauty of the natural world. Sky, clouds, water, rocks, shells — objects and images gathered, rendered both elemental and elegant. I have always been impressed with Nancy’s integrity as an artist. She does not rely on formula, instead relentlessly exploring an idea until it reaches its natural conclusion, sometimes revisiting a work over a period of years. Moonlight on the Mississippi is the culmination of thousands of hours of living by, observing, remembering, dreaming, and otherwise being inspired by the Mississippi River. In considering the art of Nancy Purington it is significant to note her intense and enduring fascination with water in all its various states and forms. The artist recounts having grown up along the banks of the Mississippi River, and that as far back as she can remember, water has been a constant, compelling, and enduring presence in her life. Undoubtedly the flowing waters left their mark on her, washing over her as a stream will polish a stone, over time helping to mold and shape her into the artist she has become. Purington has welled and distilled her reservoir of experience to produce a deep and richly textured body of work. A master of rhythm and pattern, her work is at once concerned with aesthetics and rich in symbolism and associations. She recognizes that light and water enjoy a special and ever-changing relationship, the two engaged in perpetual interplay. In her studio, Purington bears witness to this exquisite dance. She expertly harnesses light, pairing it with arrangements of pigments, inks, dyes, sticks, stones, shells, pearls, gold, and oil. Her use of metallic elements perfectly mirrors the reflective qualities of her subject. Purington’s work is beyond mere decorative effect, greater than a faithful reproduction of picturesque aquatic landscapes. Her images are not so much about the particular; they are deeper, more evocative. Purington helps us to truly see and feel water — a substance with very complex and seemingly contradictory optical properties and spiritual references. re-emerge mesmerized, satiated, moved, and transformed. Nancy Purington’s work is seductive. It entices the viewer, subtly and gradually at first, then grows, and consumes. The viewer is immersed in her world of stars, suns, moons, rivers, lakes, and water of every kind; the sky and the land, and where they meet; the land and the water and their meeting. But not literally — nothing is literal in Purington’s work. It is not the physical representation of nature but rather the forces of nature —its movement, its flow, its rhythm — that interest her. She expresses this in abstract ways combining rich color and dense pattern, with a calligraphic insertion from time to time. In doing so, Purington insightfully reveals the true essence of nature. Luminous colors, studied textures, and repeating patterns are Nancy Purington’s tools for expressing the ever-changing moods of the Mississippi River. A self-described student of the mighty river, Purington’s works are meditations on the Mississippi’s moments of calm, bursts of overwhelming brightness, slow drifts of murky fog, and clashes at the confluence. Oils and precious metals are combined to capture golden and silver reflections against a background of mystic dark navies, satin blacks, emerald blues, and pools of white. Purington places the viewer on the water’s edge, ready to make either a peaceful passage or a dramatic battle down river to the gulf. Purington’s work, like the river, has the ability to transport.